I'm not sure if I have mentioned it before but I've always loved the Ikea Rastog utility cart. I just never had any valid reason to bring it home with me. But thanks to the smart ladies over at Tinker Lab, I now have the perfect excuse totally practical purpose. Woo hoo. 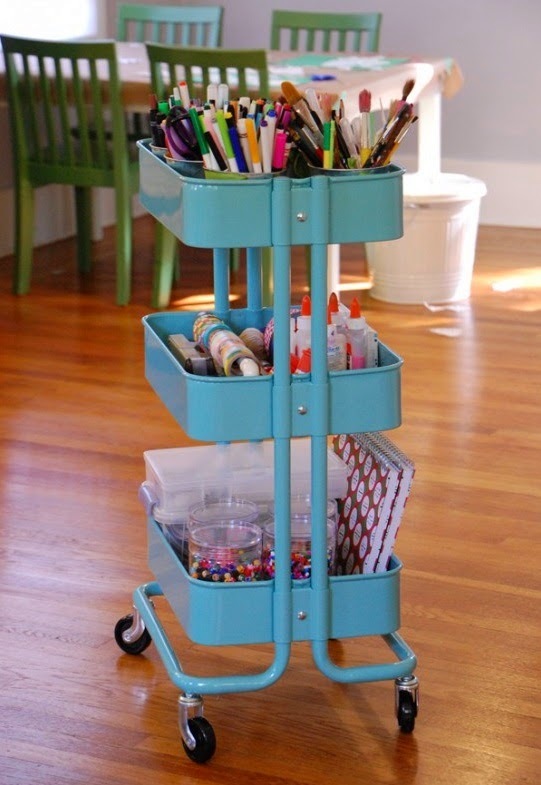 I'm definitely getting an art cart. I mean Aggie, Aggie is definitely getting an art cart. you don't need an excuse! I got one a while back and ended up moving every piece of furniture on my first (very small) floor to fit her in - but it was oh so worth it! I love it -so cute! I know I shouldn't really need an excuse b/c I really do love this little cart (for reasons I can't really explain). But now I have no reason not to get it. Of course now that I've decided I'm finding all other kinds of cute similar carts elsewhere. Someone stop me! Adorable! That could be used in a thousand different ways! These are the kinds of things we need in our homes... great multi-taskers!